General Tagged Backups Comments Off on Windows 10.. protecting it.. Sorry to harp on this topic so much, but I want to save you from abject disappointment in the event that your system has a major crash..
.. read and reread, then take practice runs at what it tells you until such time as you are sure about what you are doing, ok? If you don’t have a reliable external storage device, now would be a good time to acquire one..
Make a copy or lose it..
General Tagged Backups Comments Off on Make a copy or lose it.. The impending Windows 10 is being offered to all Windows 7 and 8 users for FREE, but it is not free forever, and you will have to keep your copy safe. Now is the time to learn how to BACK UP. It deals with the backup function found in Windows but you can use any solution you like. The important part is that you back up, make a copy, call it whatever you like. It’s simple, works across multiple operating systems and is easily installable. There are others but they all look very similar and do essentially the same job. Aomei is free by the way. The end result if you do Not try to protect your free copy of Windows 10 is that you will have to start paying out, either to the manufacturer for recovery disks of your original operating system, or for retail versions of Windows 10, $99 for the standard version and $199 for the pro version. I would think that either option above is a good incentive to go for the back up route which you should have been doing anyway if only to ensure that all of your precious data was and is not in just one breakable container. Are you a dyed-in-the-wool Windows 7 user? Windows 7 was good, a welcome relief from what became the Vista saga, but it was never going to be the best ever Windows operating system. No Windows operating system has ever been the best ever but it might have made it to ‘best to date’. Well, there is a new kid on the block, Windows 10. Windows 10 builds upon Windows 7 and 8 to bring you the best of all worlds. The start menu makes a welcome return, giving you that classic ease of access to all that is installed.Just lick on the Windows 10 logo to get the ‘Metro’ style where you can pin your favourite apps or on the parallel lines just below the logo for all that is installed on your computer. Right clicking on the logo gets you to many of the most used Control Panel functions, including the Control Panel itself. Adjusting the system has never been easier. Windows 10 apps have more features and a lot more function than their early Windows 8 counterparts, so you can forget all of the myths and rumors that abounded. Reliability has also improved greatly, and I must admit to enjoying use of some of them. A great deal of software which ran on Windows 7 and 8 will also run in Windows 10. That has to be great news, being able to see and use familiar and or older traditional desktop programs.like your favourite mail client and office suite. Microsoft Office 2007, 10, 13, and the upcoming 2016 version are all compatible too. Windows 7 didn’t always play ball, and often the computer had to be cold started. Windows 8 was a huge improvement, only requiring ONE cold start in three years. Will it run on my existing computer? This has always been a worry in the past. All too often, a new operating system required newer and evermore powerful and supported hardware on which to run. This blog is presently being put together from a vintage 2010 Toshiba netbook. It ran slowly on Windows 7 Starter, but has been a joy to use in Windows 10. Originally, the only driver support was for Windows 7, but Windows 10 supports all of the hardware, including the webcam and now aging Wi-fi card. After the release of Windows 8, I honestly believed that this underpowered little netbook had come to the end of its days, but no. It lives on with Windows 10, and if your PC has told you that it will work, you too will not have to rush out and buy all new stuff. If your printer or scanner was supported by Windows 8, it should work for Windows 10. Unfortunately, the same might not be true for Windows 7 era stuff, bearing in mind that your selected device might have been close to being pensioned off by the manufacturer at the time you bought it. Generally speaking, if the manufacturer driver support pages still show Windows 98 drivers, you may be out of luck. Having said that, it may be time to get a faster and more efficient printer anyway with the cash you would have used to buy a new computer. This is a first and an offer which should not be refused. It is FREE for the LIFE of the computer upon which is installed. You will NOT be asked to pay anything after the first or any subsequent years and you will not be asked to pay for updates. It really is yours for free and you will be given the option to create recovery media in the even that you suffer a major problem with your installation. Note that you MUST make the recovery media if you want to insure against total hard drive loss. This apples not only to Windows 10 but to everything that you have on your computer. You have nothing to lose and everything to gain. Don’t prevaricate, don’t wait for service pack 1 (there won’t be a service pack anyway). Take up this offer just like you accepted Windows 7. It really is that good, and must be because I didn’t like this small netbook at first, and I am happily using this as I would normally use my large desktop machine, and I am still having fun. .. and join Microsoft Stores to celebrate Windows 10 with Special Events, guest appearances, workshops and more.. I have been out of the loop for a while due to health issues, but I am back for a while at least, and would like to put my weight behind the core of this article. I was so against tiles in Windows 8 and not without reason. They were HORRID AND UNRELIABLE. My experience with Windows 10 tiles is much better, and I quite like some of them, especially as they no longer have to take full screen. The release of Windows 10 will start while i am still here in rehabilitation after breaking my hip, but I am hoping to be released soon and get back to supporting my local clients and those in the Microsoft communities..
Good luck with the upgrade to Windows 10, hoping that you will like it as much as I do..
General Tagged Windows 10 Comments Off on FREE Windows 10.. The more that you read, the worse it all gets, but as I see it, the picture is quite clear. 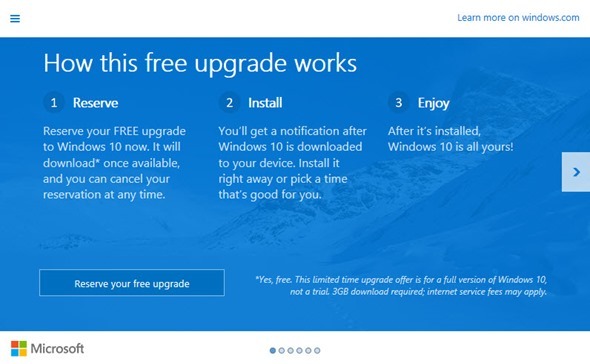 After July 29th, assuming that your PC was running Windows 7 or 8 from the hard drive, and you find yourself running Windows 10 from the VERY SAME hard drive, you have a free copy of Windows 10 which will have a function to create recovery media such that it can be kept running for free for the life of the machine. If you choose NOT to create the recovery media and something goes wrong big time, who’s fault is that? This will also get the full upgrade, BUT it is NOT the same as if the upgrade is done from a running Windows 7 and 8. In order to stay FREE, the user will have to STAY in the Insider Program. My Netbook is running a clean Preview, BUT I was careful to keep the qualifying Windows 7 on the original hard drive. Before July 29th, I will re-instate the drive, do any updates that are require, and then let the upgrade do its stuff. In this way, I will get the full FREE experience..
Operating system upgrades have always required that they are done from a qualifying base, and in this case, the base is Windows 7 and 8. Email clients for Windows 10..
Apps, General Tagged email Comments Off on Email clients for Windows 10.. There are webpages which proclaim best this and best that and this one deals with email clients. There is no ‘best’. It is all down to whatever suits you. I grew up on Windows Outlook Express, am used to the setup, general feel etc, and am not dumb enough to dislike Microsoft and have to back it up by using a non-Microsoft email client. So, I use Microsoft Outlook 2010, part of the 2010 Office suite as the main client, and I have lesser accounts running into Windows Live Mail. All are POP3/IMAP capable. .. some of the others is that they can be pigs to setup and often introduce elements which can cause email grief BIG TIME. One that springs to mind is INCREDIMAIL. Incredimail users can have all of the fun that they like at their end, but should should be respectful that most if not all serious mail systems will filter out every last ridiculous effect that Incredimail adds. For simple email, contacts and Calendar, stick with Microsoft. They work and one of then is FREE, and can be downloaded here..
General Tagged Windows 10 Comments Off on Scratch GWX..
and it still doesn’t go away. Really, I promise to do it as soon as possible. I like Windows 10 and have promised. What else can I do to stop GWX appearing in the N.A.? General Tagged Windows 10 Comments Off on Windows 10 Upgrading..
A nice article here on the Windows 10 upgrade process. Give it a good read through because you are going to lose some of your older stuff. Microsoft persist in quoting this.. Note that it is the BARE MINIMUM required, and if you want Windows 10 to work really well, ensure that your machine easily surpasses the list above. Even though Windows 10 is generally smaller and leaner than its predecessors, it still needs room to move, to update, to save stuff, so forget the Hard Disk Space line. You will want a partition size of at least 100gb in use or you will be forever running out of free space. No native Media or DVD playback? In Windows 10? Apps Tagged Windows 10 Comments Off on No native Media or DVD playback? In Windows 10? .. which look like they might, but to me, they are not very good. There is a function called ‘Film and TV’ but it looks primitive at best. There are rumours that Microsoft may produce a replacement for Media Center, but the article I read about the demise of Media Center did not seem anywhere close to hopeful. Computer users looking for entertainment stream stuff these days because that is the way it is all going, and that is fine if you live in a city block where high speed Internet of 60 – 100mb is a given. Unfortunately, even some city dwellers don’t get those speeds, and have to rely on older technology to get services like TV to their equally vintage computers fitted with TV Tuners. All is not lost. Now, bear in mind that I am just trying to be helpful because I have never had a need to run Microsoft’s Media Center, but I have heard and read that there is a simple to use alternative to Media Center called Kodi. It looks to have lots of features and who knows, you may even prefer it..
Netbooks, tablets, phones and super-thin notebooks don’t do DVD playback by virtue of having no DVD player, so one can understand why a DVD player might be missing from Windows 10. Desktop machines without DVD players have also been appearing on the market, and it looks like DVD might be on its way out. Well, they are slow, aren’t they !! Having said that, we all have media from various sources, and VLC Player will handle them all, including DVDs. It has been around for a long time in actual fact, and it is still good and works for Windows 10. Ready for 10? You should be..
General Tagged Windows 10 Comments Off on Ready for 10? You should be..
Windows 10 is ok, better than ok actually. My Netbook was one stodgy, slow Windows 7 performer, but now it boots quicker, resumes quicker, just seems like a new machine. It will never be a top performer, but I am impressed by how Windows 10 works on it. It has shown just how old-hat Windows 7 is by today’s standards. I have known that since installing Windows 8 on my big machine, so it comes as no surprise to me. Do I like the Windows 8 style apps? No, I don’t but Windows 10 will run traditional desktop versions just like Windows 7 and 8 did. This is a tough one. When hardware works , it is hard to dump it but, older hardware, while it may be working, may not be working as efficiently as newer stuff. This is definitely true of printers and ink use. New models are generally much greener where ink use is concerned, and the better printers (not necessarily the most expensive, btw) have separate cartridges for each of the colours. Wi-fi adapters of the G type are also on the ‘must replace’ list. I doubt that there are drivers for many of them anymore but, with a maximum throughput of only 54mb, would you want it as part of your 100mb Internet connection? Let it go, and any old G router you have. They are museum pieces.. If you want to play old games, run old PIMs etc, buy an old computer on which to do only that, and maintain your shiny new machine as an ‘old software’ free zone. No, it is not easy to give up on some software, but you have to be sensible about it, especially where there is no longer any support because the original authors dumped on their one-time baby. I have to make factory recovery disks for the big Lenovo, but I will not be doing that for the Netbook or the HP Elite. They will get the Windows 10 upgrade pretty much as soon as it is offered up. My big machine will be the last to be updated mainly because it is still stable and I can sort issues out if anything goes wrong with the others. This PC holds everything that is needed for the other computers on the network. This is the one which will get Start10 installed if only to facilitate the way I work and the purpose to which the big machine is put. The others will rely on the stock Windows 10 Start menu which will be fine for what the users do on the respective machines. General Tagged Windows 10 Comments Off on A gentle reminder.. Updated..
It’s unobtrusive and you can’t click on it by accident and start the Windows 10 upgrade immediately because that is NOT how it works. Can you spot the ‘extra’ which appeared on my NA? Yes, it is the Windows 8/10 logo, and this is what it looks like if you are using a more classic menu in Windows 8.1. Mine is Start8. So, when you click on it, you get this..
OK, excitement over. What were you expecting? I haven’t reserved my upgrade yet, so if you are desperate to find out what happens next, click on the ‘Reserve your free upgrade’ and then come back and we can compare notes.. Breaking news. Windows 10 will be made available for upgrade on July 29th 2015. General Tagged MS Office, Windows 10 Comments Off on Windows 10 Preview 10130.. It is also running the Microsoft Solitaire Collection preview and Microsoft Office 2016 preview, and everything works very well..
10130 is all about cleaning and polishing, so no big new features in this one, not that I have seen much of what I would call BIG. Features like Cortana and speech recognition are more annoying to me than big, so I ignore them. It doesn’t leave much.. oh well. .. is a lot like its predecessors so is easy to fall into using. I have set up a couple of lesser accounts, and have not imported anything from my main PC because the Toshiba is portable and I am not about to take the chance of losing it full of info..
Well, at least I will have something that runs on the Netbook. These games work fine, but not all games do because of the very restrictive screen resolution. The Toshiba has the 1024 x 600 screen. Later netbooks like Acers have 1366 x 768 which is a huge step up.. The Netbook is managing more than I ever thought it would, so for now it gets to keep it’s very own hard drive..
home remedy on The CoolerMaster Hyper 212 Plus..
Stevie on Remember the ‘wow’ factor? Kapil Arya on MSN Messenger..
Mike Hall on Not genuine after a clone..